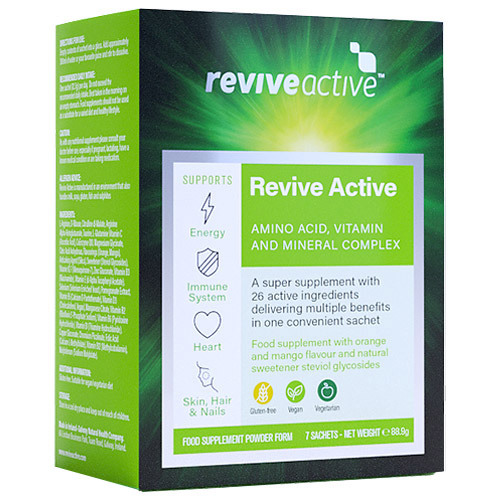 Revive Active Health Food Supplement is a natural high quality blend of 26 active ingredients delivering a multitude of health benefits in one convenient daily sachet. Benefits of Revive Active includes natural sustained energy, reduced fatigue, supported heart health, a reinforced immune system and healthier skin, hair and nails. The Health Food Supplement contains CoQ10, vitamin B12 and ribose for natural energy throughout the day without a crash. It also contains L-arginine, L-citrulline and thiamine for the heart, vitamin D3 and vitamin K2 for bones, as well as vitamin C, vitamin E and B-complex vitamins for the immune system and riboflavin and selenium for healthy skin, hair and nails. These are just a few of the ingredients and health benefits of the award winning Revive Active Health Food Supplement. It does not contain any binders, fillers, additives, artificial colours or flavours and is suitable for vegetarians and vegans. Watch below as Linda Barker talks about her experience using Revive Active Health Food Supplement. L-Arginine, D-Ribose, Citrulline DL Malate, L-Arginine Alpha Keto Glutarate, Taurine, L-Glutamine, Vitamin C (Ascorbic Acid), CoEnzyme Q10, Magnesium Glycinate, Citric Acid Anhydrous, Flavourings (Orange, Mango), Anticaking Agent (Silica), Sweetener (Steviol Glycosides), Vitamin K2-7 (Menanquinone-7), Zinc Gluconate, Vitamin B3 (Niacinamide), Vitamin E (d-Alpha Tocopheryl Acetate), Selenium (Selenium Enriched Yeast), Pomegranate Extract, Vitamin B5 (Calcium D-Pantothenate), Vitamin D3 (Cholecalciferol, Vegan), Manganese Citrate, Vitamin B2, Riboflavin 5`-Phosphate Sodium), Vitamin B6 (Pyridoxine Hydrochloride), Vitamin B1 (Thiamine Hydrochloride), Copper Gluconate, Chromium Picolinate, Folic Acid (Calcium L-Methylfolate), Vitamin B12 (Methylcobalamin), Molybdenum (Sidum Molybdate). Empty contents of one sachet into a glass. Add approximately 300ml of water or your favourite juice and stir to dissolve. One sachet (12.7g) per day. Best taken in the morning on an empty stomach. Below are reviews of Revive Active Health Food Supplement - 7 Sachets by bodykind customers. If you have tried this product we'd love to hear what you think so please leave a review. I have been researching the best supplements and started taking this a year ago. As I have a chronic illness the effect was a bit longer... around four weeks, then suddenly one day I felt better, less fatigue and less stressed. I noticed that everyday I felt this improvement. I told my sister who then started taking it, she then told a friend who told her friend and now there are six of us taking it. It is definitely a fantastic product, yes it is a bit expensive BUT ISN'T YOUR HEALTH WORTH IT? 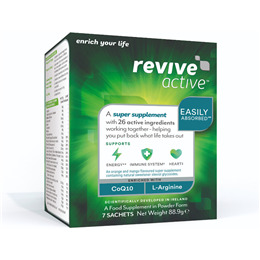 I have been taking Revive Active for several months now. I love it because it provides everything I need in one sachet. What a great way to start the day knowing that I have all the nutrients needed to get me through a busy day. I have noticed a big improvement in my energy levels since taking it and find I now get more out of my day. I do think it is expensive but it works and I feel it is worth it. I've been taking this product for 3 months. I take it first thing in the morning and alternate between revive active and revive mastermind. This product was recommended by my specialist as part of a treatment plan for Chronic Lyme disease. I've been taking this along with other medication and I've just started to notice an improvement.This will be one product I'll be continuing to take for sometime. I have been taking Revive Active for 2/3 months + now. I don't like taking vit. pills so this product is much kinder to my stomach. Taste is OK. I have noticed little difference in my energy but will keep taking it a little longer to see if it improves. I do find it costly for what it is. Revive Active is brilliant, I do a lot of cycling and running, since taking revive active I have more energy some people say it's dear, but I usually get it at 39.99 have been on it for 6 mths. Taste is not great but it works for me. I have been asked to review this and I am getting a months supply free great benefit to me as my wife has just started taking it. I have been taking this product for 6 months now and have it as soon as I wake up. The taste is quite enjoyable and better than boring water taste. I can't say I have noticed an energy increase but my nails are a lot stronger and healthier since taking this. Decided to try this product as I was feeling very tired with low energy. I honestly felt a huge difference in a few days. I love this product. The only negative I have is it’s price, if it cost less I would definitely give it 5 stars. I have been using this supplement for a couple of years now and I think it is excellent. I don't like taking pills so to take a supplement in powder added to water is fine for me, and I like the taste (I have tried Revive Active Joint Complex over a period of time, which has a supposedly blackcurrant flavour but do not like the taste). I feel that I have gained a lot of energy through taking this supplement and would recommend anyone to try it and give it time to feel the benefits. There were problems in freshness of two separate batches I received and I was given a full refund; I was told that with an improved method of production the powders will stay fresh over a long period of time, and I have had no further problems over the past few months with the powders sent to me. Not had a great response to my health since taking it. I will try again and see. Quite pricey for what you get. I don't like taking pills, so this supplement suits me. I have been taking this supplement for about 2-3 months not seen a great difference in my energy really but will try for a little longer A little pricey for what you get. Sorry, did nothing for me. The orange, I didn't like, but then again I don't like orange. But you have to try it, to find out if its suitable for you. Bit expensive for what it is. Sorry, but I will not be ordering again. Have not tried long enough to say it's working - the downside for me is taking it on an empty stomach as recommended, that leaves me feeling slightly queasy. So now I drink it after food - maybe that's not so effective? - we'll see! Excellent product, though a bit pricey. This is really expensive, but I gave it a go as I had been feeling very low in energy. I have seen an improvement - whether it's the onset of spring or the supplement, I don't know but I'm going to reorder and try it for longer.